Category Archives: What is a “Good-Bye Kit”? “Good-bye kits” are for the kids we’ve been working with as they leave the shelter. 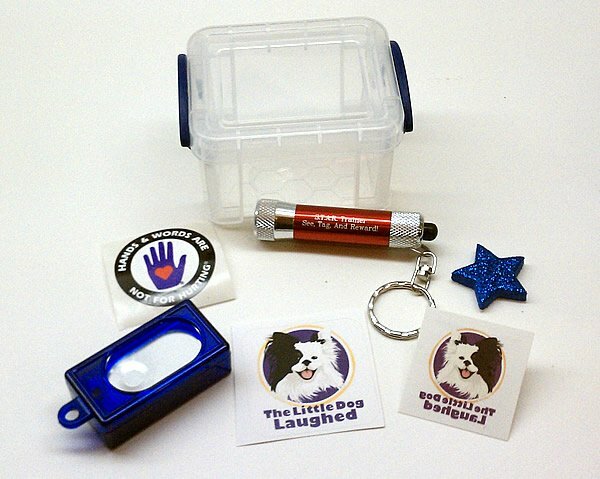 These tiny 2″x2″x3″ boxes contain a temporary tattoo and a sticker, both with Eli’s laughing face, a “Hands and Words Are Not For Hurting” sticker, a clicker, and a tiny but powerful flashlight inscribed “S.T.A.R. Trainer – See, Tag And Reward”. ONE: Children in shelters live in a frighteningly chaotic time of too many abrupt changes with no closure. Our teams will never know when a visit with a child is the last, and we don’t want to become just another perceived abandonment. Goodbye kits give the shelter personnel the option of giving departing children a gift “from Eli”. Director Posted in About the STAR Program, What is a "Good-Bye Kit"?